Sunday June 29th 1890 After the morning work was done I went with Will out to the pasture to water the cattle. We got some dinner over and read and slept all afternoon. There was a shower in the evening which cooled the air finely. Monday June 30th 1890 It was cool this morning and we had the washing done before nine oclock and part of the things ironed before noon. Mother and I went to town in the afternoon to do some shopping. We were at Hatts quite a little while We came home before it was too late to do the evening work. [the following text is written vertically in the right margin of the above entry] Ott here this morning to tell about Burlington business. Tuesday July 1st 1890 Mother and I took an early start to drive down to Aunt Ems to spend the day. We had a pleasant ride and visit. I drove bay Nellie. When we got home we found the boys had been havuing a great time killing mink in the wood pile that were after the chickens. a cool day. Wednesday July 2nd 1890 Mother and I drove our Nellie out to the west farm this forenoon to see how things looked. I wrote to Lee after we came back. I sewed all the afternoon fixing an old dress for Mother. weather pleasant. Thursday June 3rd 1890 We got our work done up and things fixed for dinner early in the morning. Winnie went home yesterday. Mary Woolf and her company were here for dinner. Mother went to town late in the afternoon while I got supper. I sewed a little today and worked some on the fly net. 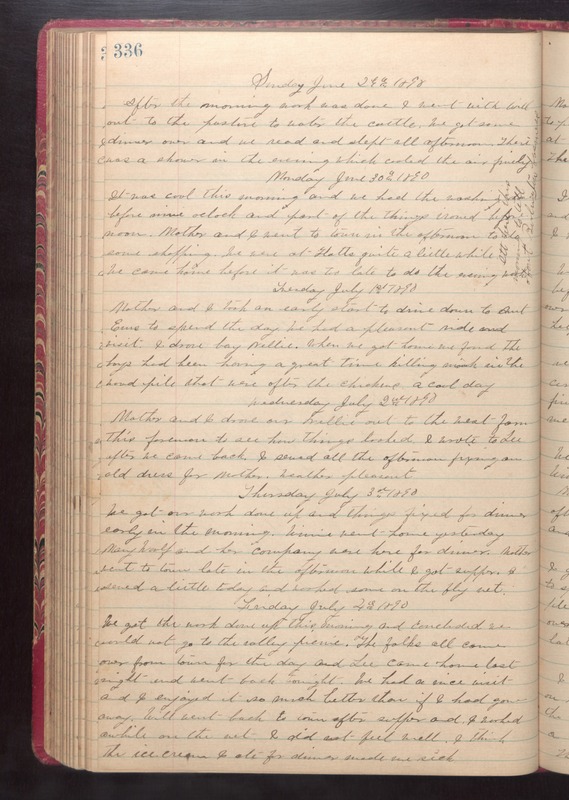 Friday July 4th 1890 We got the work done up this morning and concluded we could not go to the valley picnic. The folks all came over from town for the day and Lee came home last night and went back tonight. We had a nice visit and I enjoyed it so much better than if I had gone away. Will went back to town after supper and I worked awhile on the net. I did not feel well. I think the ice cream I ate for dinner made me sick.